You must have seen the signature Sleeping Beauty's castle in Disneyland. Today we drove along the Alphine Road and were after the real castle, the blue-map for the Disneyland's landmark, the Neuwanschtein Castle. The castle was meant to be a retreat palace for King Ludwing II, the great Bavaria King who could only enjoy his magnificent creation for less than half a year. The legendary castle is located in Fussen, around 2 hours drive from Munich along the autobund (if you wish to save time and not go for the scenic stopovers along the Alphine Road). There are yet lots of scenic spots really worth stopping over for some great pictures. We went during Autumn and were lucky enough to have perfect sunlight for our pictures. Weather was warm enough that we do not have to gear up with heavy jackets. I really did not remember the names of these terrific spots as we just randomly stopped whenever there were beautiful scenes as such. Do not worry though, you can easily spot them along the Alphine Road! 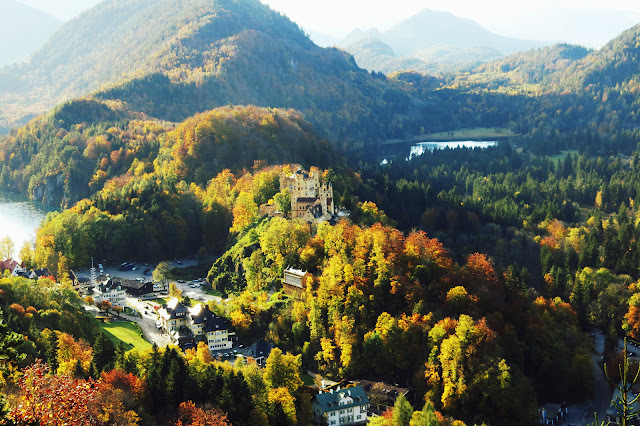 Interesting to note that in the area where Neuschwanstein stood, there are actually another less famous castle - Hohenschwangau Castle - the home of young King Ludwing II which located at the foothill. We got the Königsticket (King's ticket), which is a set for both castles that costs 24 euros. Each of the ticket would be assigned a number for the arranged guided tour at a certain time. You cannot enter the castle if you are late for the assigned time, feel like the whole system is very German. Well maintained and planned. We have Hohenschwangau Castle's tour arranged before the Neuschwanstein, so we hopped on the bus to go up the mountain. 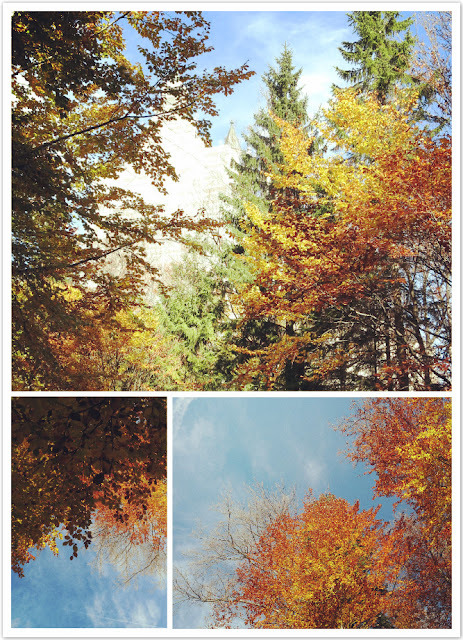 For some reason, we thought Hohenschwangau is just right next to Neuschwanstein, but we were so wrong! When we got off the bus, we tried to follow the road signs and found out that Hohenschwangau is actually just right next to the ticket booth!! We do not even have to hop on the bus in the very beginning! By the time we found out it was already too late.. we would not make it back for the tour.. so we decided just chill and stayed on the mountain, then went for a short hike to the Marie Bridge, which offers a great view of Neuschwanstein Castle from the side. The castle's west and north sides are under renovation until Summer 2013. Although you are not likely to see bamboos and scaffold in the castles of your story books, its side views still live up to the hype. It has shinning white brick walls, with turquoise cone-chimneys - look very much like a princess can easily be trapped in one of those and a flying fire dragon would be around and prevent the handsome warrior to enter the castle...... But I am more astonished by the surroundings, all the red leaves, the valley and the lake can proved my imagination of the setting of a European Castle. It is just like that, the story books did not lie! The German way is really consistent, your ticket is only valid at that very minute you are assigned to, not a minute earlier or later. The bar code reads your arrival time more accurate than your boss waiting for you at work. There is no way you can trespass the gate! We waited for a while to gather the crowd and our guide then appeared to pick us up. He is in his casual wear (yes, I thought he would be in traditional Bavarian clothing, quite disappointed) and glasses. The modern Bavarian told us it is strictly no photos, no wonder none of my travel guide has any pictures but only illustrations of it. He then showed us the way to the Throne Hall and told us more background of the castle. In a nutshell, this castle is paid out of King Ludwing's own pocket - to express his love to the great composer, Richard Wagner. One of Wagner's operas legendary character is the Swan knight, and that's how he named the Castle "Neuschwanstein" - The new swanstone. There is also a Singer's Hall which pretty much like Ludwing's own theater at home. It is used for theater plays up till these days as well. The Germans clearly know how to utilize their resources. Such a nice hall should not be left idle after all these years. We also visited the hallway, the servants' rooms, the dining hall and the bedroom. Overall I love the theme of using opera plays' character to commemorate to decorate the castle and amazed by how romantic and artistic the King was, but I cannot say I am totally thrown away by all the interior design and architecture. Maybe I could not see enough, or maybe I just don't know architecture that well to make any comment! But for more history and information of the castle, you can check out their Wikipedia Page, and Official Website.